1st Priority One Realty is a real estate agency based in Beverly Hills, California. They were opening a new office in Encino, California and they were looking for a lobby sign for the new location. From the photos, you can see that they chose a metallic finish that looks great with the rest of their interior. Diona Miller and her team can help you find the perfect home in Los Angeles and its surrounding counties. A house definitely isn’t a cheap purchase in Los Angeles, and as a real estate agency, you want to assure your customer that they are in good hands. When a client is visiting your office, you want to give the best first impression possible. This is why many professional offices will invest in a logo sign for your lobby or reception area. 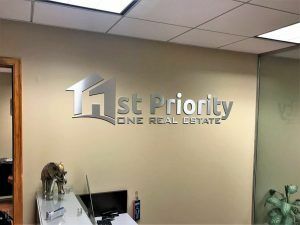 1st Priority One Realty’s logo does a great job of conveying the business services. Not only does the name of the business state what type of business they are, they also incorporated a house into the “1” to show that their focus is on buying and selling houses. With a logo like this, you definitely want to have it displayed as much as possible. When it comes to businesses that have many people coming into their office, you are losing out on a branding opportunity if you’re not displaying your logo somehow. A print or vinyl graphic is more affordable than a 3-dimensional sign, but you will not get the same impact as you would from a dimensional letter sign or an elegant acrylic backer panel sign. Are you looking for interior signage for your professional office? Give us a call or E-mail your logo to us to get started on your custom logo or reception area sign. No matter what your logo looks like, we will make sure that your logo sign looks great.